AMTECH OFFER SS THREE PIECE BALL VALVES can be operated with electric actuator – 230 V ac/ 24 V dc , single phase/ three phase electric current. The electric operated valves can be praposnate control as well as on off type.These valves are quickly and simply be fitted with electric drive. 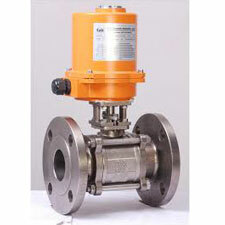 The wide range includes the right ball valve for just about every conceivable application. They are available in various materials, like CS, SS, Gun Metal, Aluminum etc. MATERIAL OF CONSTRUCTIONS : AISI 304 (CF 8), AISI-316(CF 8 M), AISI 316 L (A 351 CF 3 & CF3M ) ,LCB, WC 9,WC 6 ,Hast Alloy, Gun Metal, Brass, Aluminum, Aluminum Bronze.OPERATION: Manually Handle operated, Gear operated, Pneumatic Actuator operated, Motorised Actuator operated.